May 17, 2018 - Dubai, UAE: An OMEGA timepiece belonging to the legendary performer Elvis Presley has been sold for CHF 1,500,000 at the Geneva Watch Auction: Seven, by Phillips. After a lengthy and competitive round of bidding, the OMEGA Museum in Biel/Bienne became the proud new owner, not only attaining the watch for their significant collection, but also paying a new world record for any OMEGA watch ever purchased. 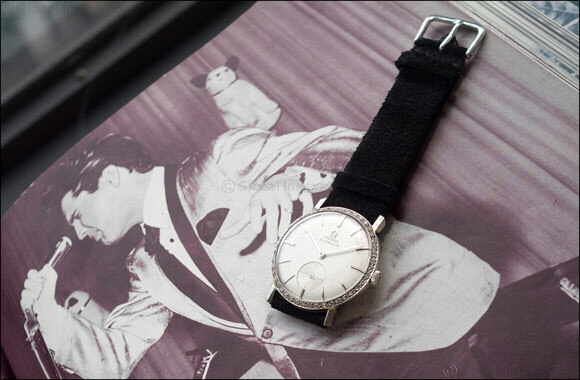 Described as the “most historically significant Elvis Presley-owned watch to ever appear on the market”, the 18K white gold wristwatch was presented to Elvis by RCA Records in February 1961, at a charity luncheon and concert to celebrate his 75 million records sold worldwide. The 33 mm timepiece houses a manually-wound OMEGA calibre 510, and features 44 brilliant cut diamonds surrounding the bezel, as well as an elegant silvered ivory dial with a small-seconds subdial. On the caseback, the engravings include the words: “To Elvis, 75 Million Records, RCA Victor, 12-25-60.” In fact, Elvis was most likely the first artist in history to reach that impressive sales milestone. Amongst his album releases in 1960, the hits that propelled him to the peak of his career that year included “Are You Lonesome Tonight” and “It's Now Or Never”. The incredible provenance of this one-of-a-kind timepiece was further confirmed by photos of Presley wearing the watch, as well as a certificate of authenticity from Jimmy Velvet, the Founder/CEO of the Elvis Presley Museum. Elvis Presley is known to have worn several OMEGA watches during his career, including the OMEGA Seamaster he wore during his time in the US Army. However, the very meaningful watch sold this week will surely be remembered as the most special.